I love repainting furniture, but I hate sanding it so the other day I tackled a project and I wanted to share my tips with you about how to repaint furniture without sanding! My last painting project involved me painting my shutters and my front door and I just love how it turned out (check it out HERE). And while repainting a child-sized rocking chair was a lot smaller of a project, there were so many cracks, crevices, and tiny places that I knew would be a pain to sand, so I decided to repaint this rocking chair without sanding. Sound crazy? 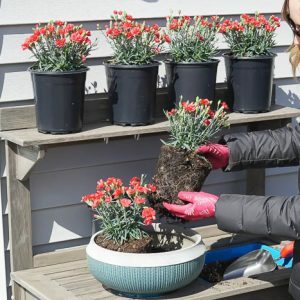 Maybe, but this is a great trick that saved me a ton of time and so I’m sharing it with you today. Typically when you repaint furniture, it is important to sand off any varnish or sealer so that the new paint will stick to it properly. But with something like a rocking chair. sanding would have been a long and tedious project. So I decided to tackle repainting it without sanding. So let’s chat about repainting furniture without sanding for a minute ok? Yes. You certainly can. But you do need to prep it properly first. There are a few ways to do this, but we choose to use an oil based primer to prepare our varnished wood for new paint. The oil based primer will stick to varnished or sealed wood. And then you can paint over it with latex paint. It is a pretty easy process all things considered. I typically use my HomeRight Paint Sprayer when painting almost any project, primer included. Unfortunately, oil-based paints don’t typically play well with any of the paint sprayers I have, so I decided to use a brush to apply my oil based primer, and then spray my latex paint on top. What kind of paint do you use on wood furniture? You can use latex paint or oil-based paint. I prefer latex (water-based paint) because clean up is so much easier and I can spray it on using my paint sprayer. But the option is really up to you! Do you have to sand furniture before painting it? So, are you ready to get going? 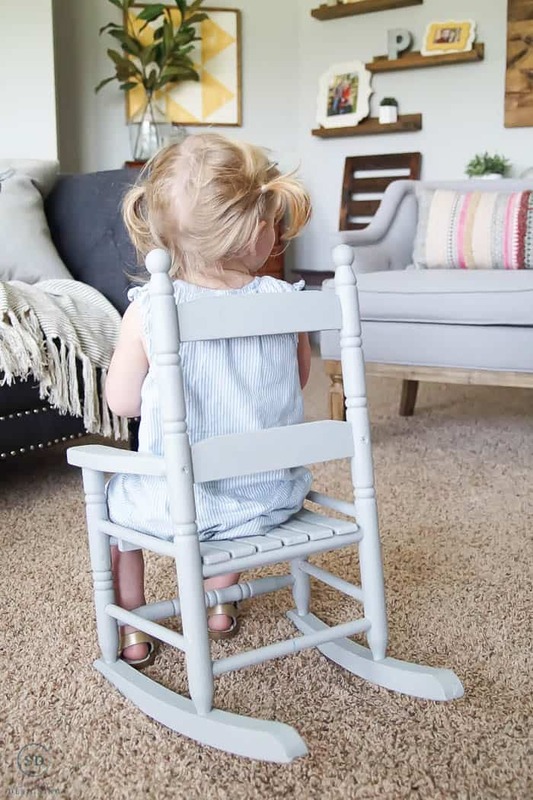 If you are looking for a similar child’s rocking chair, this one is similar HERE. 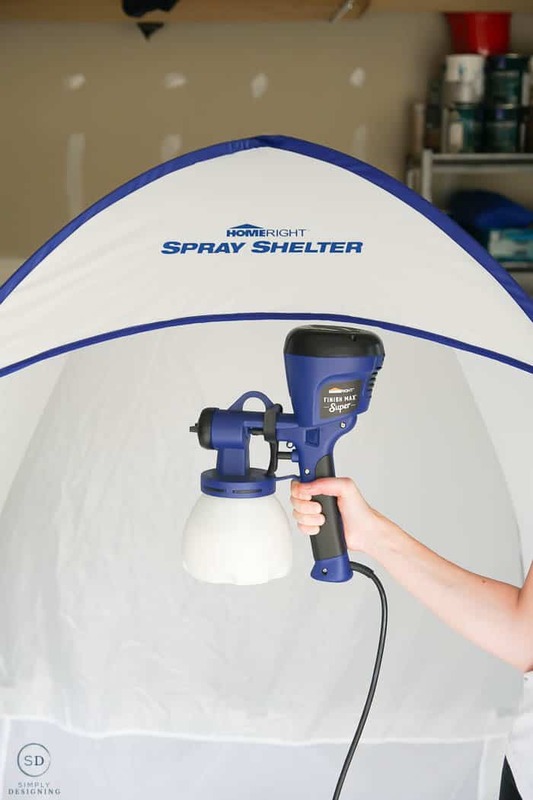 Begin by setting up your HomeRight Medium Spray Shelter Booth. It has a bottom in it, but I still put down a Drop Cloth to protect it from overspray a little more. 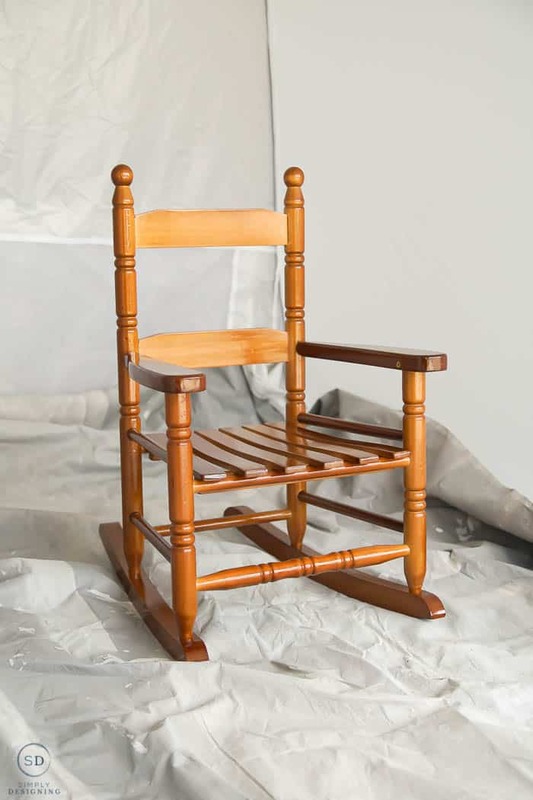 Then you will use your brush and paint the rocking chair with your oil-based primer. Follow all manufacturer instructions and let it dry completely. Next, you will thin your latex paint according to manufacturer instructions. Then put it in your HomeRight Super FinishMax Extra and you’re ready to spray your furniture! I always like to do at least two coats of paint on every project. 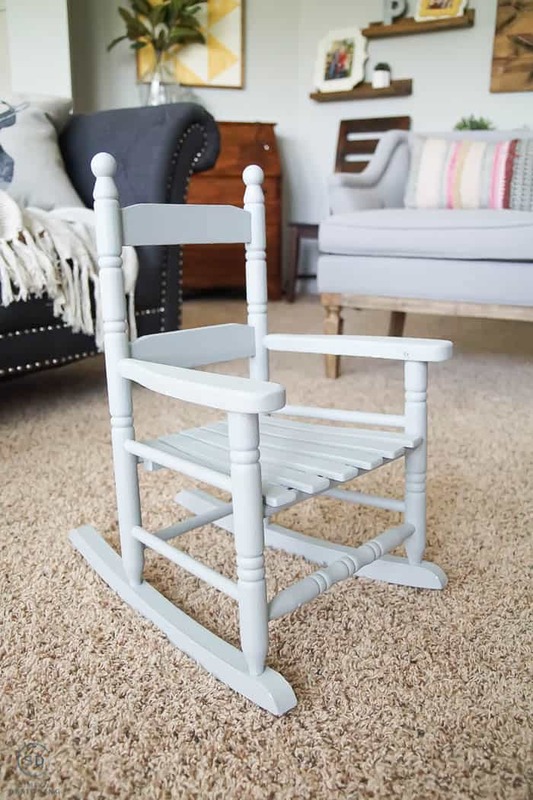 Even though there were lots of sides, corners and angles on this rocking chair, the paint sprayer made this super quick and easy to paint! This paint sprayer is the bomb-diggity-bomb…I really love it so much! It does a great job and it is so fast. I just love how easy it makes painting furniture. 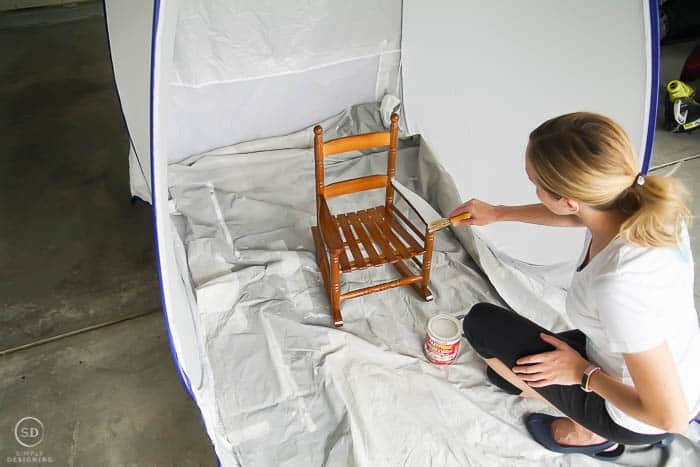 You can wait for the chair to dry and use it as-is, or you can top it with a coat of polyacrylic or polyurethane. I actually like a little wear and tear on my furniture, so I did not choose to coat this with a top coat this time. And that’s it! When it was completely dry we brought it inside and it is now my daughter’s favorite chair! 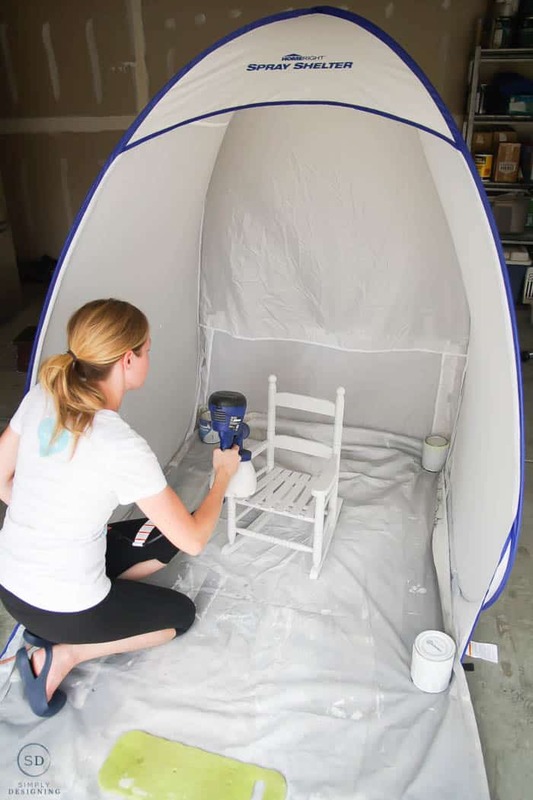 If you want to learn more about why I love the Super FinishMax Extra and the Medium Spray Shelter Booth so much, check out my blog post on the HomeRight Blog HERE. Hi, what a great post! I knew I had to click over from the Grace at Home blog hop because I have a kitchen cabinet job to do and I do NOT want to sand those cabinets.Thank you for sharing! I really wish I had a paint sprayer! It would make updating furniture soooo much easier – and the oil based primer is a great idea! 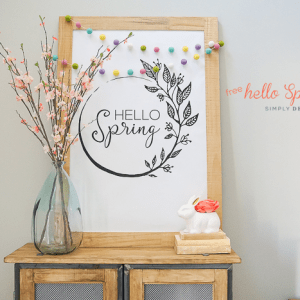 Thanks for sharing your project with the Share Your Style Link Party! !